As a group, Southern culinary memoirs have a distinct charm and appeal to readers not only because they include recipes for tasty regional specialties sandwiched between chatty anecdotes about Southern life but also, and I would argue, primarily, because they promulgate the rules and etiquette for the hospitality that has made the region so famous. A case in point are discussions of funeral fare, which show up more often in food memoirs written by self-declared Southerners than by any other regional group of food writers in the United States. Novelists like Michael Lee West, author of Consuming Passions, and the duo behind Being Dead is No Excuse: The Official Southern Ladies Guide to Hosting the Perfect Funeral, social commentators Gayden Metcalfe and Charlotte Hays, share their insights into the specific role homemade cuisine plays in both comforting the bereaved and affirming a sense of community and solidarity among the living. Aware of the fact that with the passage of time, “[w]e’re burying our best recipes,” as West’s Aunt Tempe observes (CP 7), the memoirs and guide books seek to both chronicle and preserve a way of life and a set of customs that is under threat of disappearing due to family members living far apart, the ease and temptation posed by catering services, and the failure of the older generation to transmit their culinary knowledge to their children and grandchildren. With heavy doses of humor and a dollop of nostalgia, these writers are self-appointed ambassadors of the South and share with their non-Southern readers a sense of the importance of food to rites of passage in a context unmediated by commercial interests. As the allusion to Hamlet in my title attests, funeral fare makes an impression on the grieving, rather than conveying anything specific about the dearly departed. Hamlet’s bitter charge that his mother, Gertrude, remarried with such haste that “the funeral-bak’d meats / Did coldly furnish forth the marriage tables” (I.ii.65) is not too far off the mark, since some Southern ladies use the opportunity to cook for the funeral reception as a chance to show off their culinary skills in the hopes of snatching a husband, maybe even the widower. Metcalfe and Hays contrast the customs surrounding those two key social events that mark people’s transitions publicly—weddings and funerals—by highlighting the role of the community in determining the etiquette for the latter: “Some people may hire wedding consultants, but for the funeral we rely on tradition—and input from veterans of Delta funerals past. What makes the Delta funeral different from others is the large number of friends who get into the act” (BDINE 209). Indeed, funerals are organized by others for the person whose life is being commemorated, whereas the couple entering into wedlock feed and entertain those of their friends and acquaintances they invite to witness the ceremony and celebrate their love. The Church takes center stage at both funerals and weddings, with West reminding us that: “Southern churches have traditionally provided the meal after the funeral; it can be grand or pathetic. And you can’t go by a church’s size, either . . . When it comes to good funeral food, it all depends on how many good cooks are in the congregation” (CP 132). Both Being Dead is No Excuse and Consuming Passions attest to the importance of the canonical desserts that make a funeral Southern. West explains that, “In the South, chess pie is also known as funeral pie” (CP 135), before sharing her recipe for “Lemon Chess Pie.” For dwellers of the Mississippi Delta, coconut cake fills this same comforting role, with Metcalfe and Hays admitting “We’re already thinking about this coconut cake before the last ‘amen’” (BDINE 12). The South—both Old and New—lives on in the national imagination thanks to its writers’ penchant for penning how-to lifestyle guides like the Southern Ladies’ guide to parenting, gardening, entertaining, courtship, weddings and funerals. This region affirms its rich heritage by marketing its cultural traditions to curious onlookers, eager to learn more about the mystique of Southern comfort, the last remaining bastion of gentilesse. Though I am reassured by the thought that wakes and funerals are still being portrayed as community-building events, I do wonder how much this idea persists in literature more than in real life. It would be interesting to know what sub-section of the catering industry specializes in funeral fare. The one bad thing about losing such a homey tradition, in my view, has less to do with the dishes being brought to comfort the bereaved, and more with the therapeutic aspects of having to return the dishes to the families that brought the meals. As West’s mother points out, this obligation forces the widow or widower to go out and face the world one more time, thereby putting one’s grief in context with the ongoing rhythms of life. Perhaps that in itself is enough to make us preserve, or reclaim, such culinary traditions. Metcalfe, Gayden and Charlotte Hays. 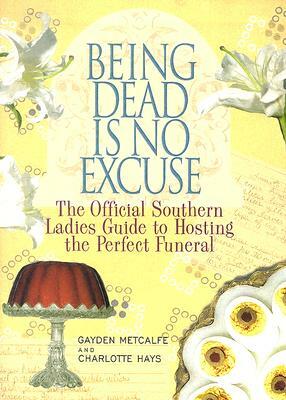 Being Dead is No Excuse: The Official Southern Ladies Guide to Hosting the Perfect Funeral. New York: Hyperion, 2005. West, Michael Lee. 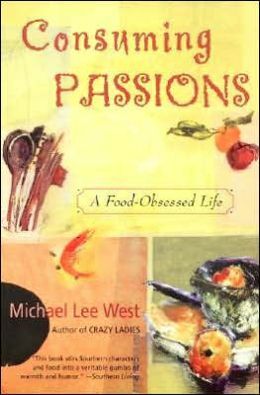 Consuming Passions: A Food Obsessed Life. New York: Perennial, 1999.